Can't think of a Valentine's present for your sweetheart? On the heels of Monday's class announcement, we have another upcoming class that is sure to delight the loved ones in your family. If you're anything like me, thinking of a Valentine's gift for your loved one can be difficult. Sure, there's the tried and true chocolate and flowers and the oh-so-cliche romantic dinner, but this year, I've got one word for you: Plushbot. Plushbots are cute stuffed animals chock-full of electronics. In our Valentine's Day Plushbot class, you'll learn how to make things like a stuffed plush heart that lights up when you bend its arm for your cutie, a bird ornament that makes noise when it gets dark, or a frog that lights up and makes noise when it gets dark. 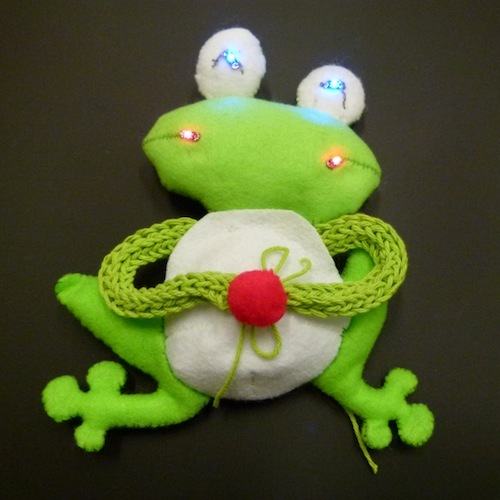 These projects make for excellent gifts or just an excuse to get your significant other into electronics. They are great for kids and adults! The class begins with an introduction to Plushbots by the creator, Yingdan Huang. Students can choose one of the three patterns to create. After lunch we will program the projects and troubleshoot the circuits. By the end of the day, students will take away a functioning Plushbot. This class takes place on Saturday, February 11th from 9 AM until 5 PM. Hope to see you there! I'm waiting for someone to attach a GPS module, flight controls and program it to home in on egg stealing pigs. Meanwhile, everyone comments on the SOPA post. Bad timing, plushbots. As I described in yesterday's SOPA/PIPA post, it wasn't easy arriving at the decision to come out with any stance on the matter as an organization. That was a decision that was arrived at yesterday morning when this PlushBot post was already up. Laura Mappin and I created a similar class a while back, "RoboBunny". Students would gut a stuffed animal, add a 3rd party arduino board, a shield board I designed, put it all together, and "bunny" would recognize being held, or crushed, flash it's eyes, play songs, and go to sleep after a period of not being played with. I've since added an IR receiver and transmitter and servo "ports". Don't have any behaviors for the servos yet, perhaps something like Becky Stern's scorpion perhaps? I figure the IR receiver will be used to troll folks. Watch what buttons people press on their remotes, and then randomly replay them later. "Now why does my TV keep changing stations!!!!". Where should questions about the classes be sent or posted? I've been thinking of ordering two of the plushbots class as a birthday gift for a kid of mine involved in sewing, robots, and cake decorating projects this year, but have some questions before committing to it. Hi there, you can send any questions to education@sparkfun.com. Thanks for your interest! Are these available as kits for those of us who can't make it to Colorado? My wife has been teaching my son how to use the sewing machine and I think it would be neat to have a project to incorporate his interest in electronics. 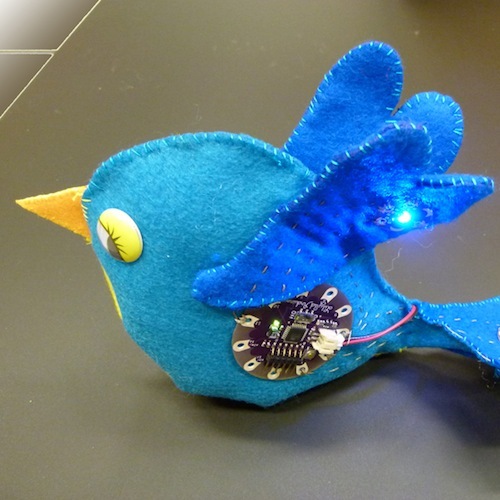 I think I recognize some lilypad components on the bird. We're hoping to be able to make some kits for this and get some tutorials made up. I'm not sure when they'll be available, but many people have been interested in this, and we are aware. Thanks for your interest, and keep posted!